Spondylolisthesis is a condition of the spine a vertebra shifts out of its proper position in relation to the neighboring vertebrae. This article will delve into the causes of this condition, as well as diagnosis and treatment options available. 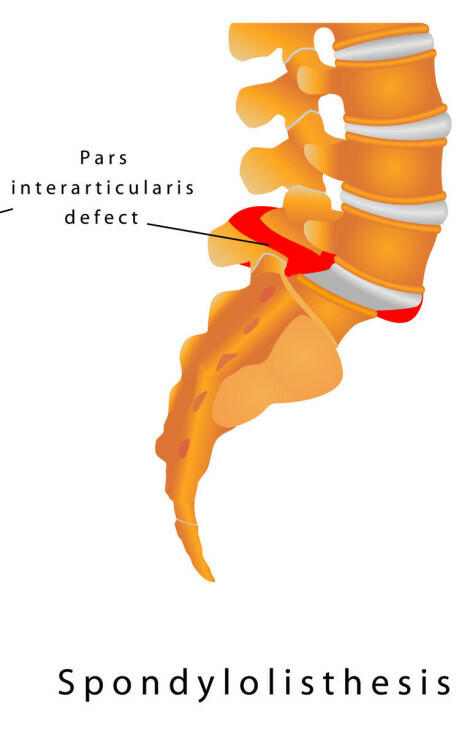 The causes of spondylolisthesis vary based on the age and medical history of the patient. In young patients, the condition is most often present in the lower back and is usually the result of a genetic birth defect or acute trauma. In adult patients, spondylolishesis is more likely to be the result of wear and tear on the vertebrae and surrounding cartilage. The condition can also be an after-effect of another condition known as spondylolysis – a stress fracture of the vertebra. Sometimes a stress fracture can weaken the vertebra to such an extent that the bone shifts out of its normal position. To diagnose the condition, your doctor will first perform a physical exam, particularly taking a close look at your spine. If they suspect spondylolisthesis, an x-ray can confirm the diagnosis by showing whether or not the vertebra has slipped out of place. Treating spondylolisthesis is widely dependent on how severe the slippage of the vertebra is. If the slippage is mild and the patient exhibits little to no symptoms, you can likely continue to participate in daily activities and most sports. If there is pain involved, you may be asked to avoid sports and focus on conservative treatment methods like bracing, physical therapy exercises, and medication. On the severe end of the spectrum, surgical fusion of the vertebrae may be necessary if there is severe pain or any associated muscle weakness.